It’s called a Percheron and I rode one this summer on a trail ride with several of my family members. Not this particular one but one like it. Initially when I saw this large horse I took it as a compliment. I thought to myself “hey look, I got the biggest horse. They must think I am a stud.’ Until one of our trail guides said to me, ” Don’t worry he is a very gentle horse we often let the children ride it”. Oh, the burst my bubble. Just like he said this giant of a horse was very mild and meek. Often when we hear the words of Jesus “Blessed are the meek for they will inherit the kingdom of God” we think he is talking about some weak little person who everyone runs over. But I believe that is not what Jesus meant at all. The word for ‘meek’ here actually can be translated humble and it’s origin comes from an animal that has been broken or brought under control. 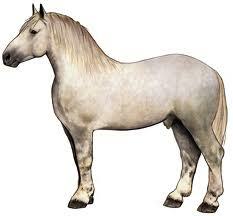 A Percheron is a powerful horse often used to pull wagons yet gentle enough for a child (or me) to ride. Wow! What a true picture of meekness. It is strength under control. Let me share with you what meekness is or does. Meekness rest in the promises of God. Meekness trust in God’s plan. Meekness seeks the good of others and God’s kingdom. A great scripture on this is Psalms 37:1-11. In this scripture David encourages us to trust in the Lord and do good. He also encourages us not to get distracted from that when those who do evil seem to win or get ahead. Why? Because in the end the meek will inherit the earth Psalms 37:11. Meekness is entrusting our hearts and lives to God and submitting to His word and will despite the circumstances we might find ourselves in. This truly exhibits strength. It takes strength to forgive and bless others when we have been mistreated. It takes strength to stay in a difficult marriage in obedience to God. It takes strength to serve in the church while being criticized. It takes strength to do things right even when doing things the wrong way would move us ahead in this life quicker. But listen again, ‘Blessed are the meek (mild, patient, long-suffering) for they will inherit the earth”. Matthew 5:5 (Amplified) Remember meekness is not weakness rather it is an attitude of an obedient humble heart before God waiting to see the promises of God fulfilled and those who are meek will inherit the earth. Just thought I would share some of what I have been teaching on Wednesday nights here in Barcelona. We have been working through the Beattitudes. Here is the first week’s sermon. One evening I was sitting with my boss eating dinner. At that time I worked for a Christian Counseling agency in Texas and we had traveled to another part of the U.S. to promote his new organization he was starting. As we spoke I told him of how unsure I was of my relationship with God. I told him though I knew I had prayed to receive Jesus as my Savior it had been a while since I felt real joy and contentment in my relationship with God. His reply to me surprised me. That was not what I was expecting. I was expecting something like Brian you are actually a pretty good guy. You go to church, you help others, you tithe, you are actually not bad and besides that you trust in Jesus Christ as your Savior but that is not what he said. He said, ‘Your problem is that you don’t know how bad you really are.” At that moment what my boss said to me did not seem like an encouraging word but as I thought about it, as God dealt with me I realized my boss had spoken a great truth to me. Blessed are you when you recognize how poor in spirit you really are instead of trying to earn or pay your way to God. You see, that is why I was struggling with my relationship to God because I was trying to make myself good enough. Yes, I had asked Jesus Christ to come in my heart and forgive my sins. Yes, I had been born again but somehow I had tried to start earning his love and forgiveness. No wonder I was frustrated. I was trying to do the impossible I wish I could say that I am free from that but I am not. I am still growing in the grace and love of God. I am thankful for my old boss who told me that. He helped me start on a journey of seeing that I was really spiritual helpless. So What does it mean to be Poor in Spirit? It means we are bankrupt spiritually. We have nothing we can give or bring to God to make us acceptable to Him. What do you feel when you see a beggar on the street? Pity, sadness, sympathy, or embarrassment? We are uncomfortable with poverty and need. It challenges us to see the needs around us but the question I have is do we deal with our own spiritual poverty? Do we recognize our need of God’s grace daily? Do we recognize that on our own we unable to bear any spiritual fruit apart from Jesus Christ? Sobering stuff. Nothing good lives in me, that is in my sinful nature. We are born with this sinful nature and can’t change it even though we try. We do good things like go to church, help others, and even give to the beggar on the street but do we face the reality of our sinful nature. Do we admit our hate for our neighbor? Do we admit our love for gossip? Do we recognize our stingy attitudes in giving time to our family? If we don’t admit to God the sinful desires of our hearts and instead simply try to cover them up with good deeds are we really being poor in spirit? It has been said, you can dress up a pig and put make-up them but they are still a pig! The truth is our sinful nature cannot be improved upon we must confess it to God and trust in Jesus Christ. Hi everyone we are in the States for the next couple of weeks awaiting our visas.